Although over 120 marine protected areas (MPAs) have been established along the coast of southern California, it has been difficult to monitor their ability to quantify their effectiveness via the presence of target animals. Traditional monitoring methods, such as diver surveys, allow species to be identified, but are laborious and expensive, and heavily rely on good weather and a talented pool of scientific divers. Additionally, the diver’s presence is known to alter animal presence and behavior. As one alternative to aid and perhaps, in the long run, replace the divers, we explored the use of long-term, continuous, passive acoustic recorders to listen to the animals’ vocalizations. Many marine animals produce sound. In shallow coastal waters, fish are often a dominant contributor. Aristotle was the first to note the “voice” of fish, yet only sporadic reports on fish sounds appeared over the next few millennia. Many of the over 30,000 species of fish that exist today are believed to produce sound; however, the acoustic behavior has been determined in less than 5% of these biologically and commercially important animals. Towards the goal of both listening to the fish and identifying which species are vocalizing, we developed a Fish Optical and Acoustic Sensor Identification System (FishOASIS) (Figure 1). 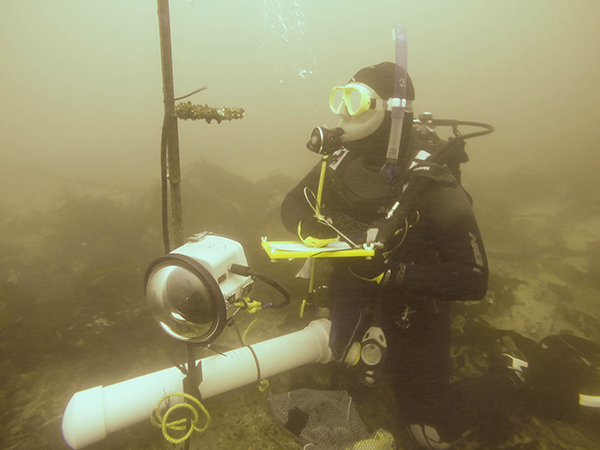 This portable, low-cost instrument couple’s a multi-element passive acoustic array with multiple cameras, thus allowing us to determine which fish are making which sound for a variety of species. In addition to detecting sporadic events such as fish spawning aggregations, this instrument also provides the ability to track individual fish within aggregations. Figure 1. 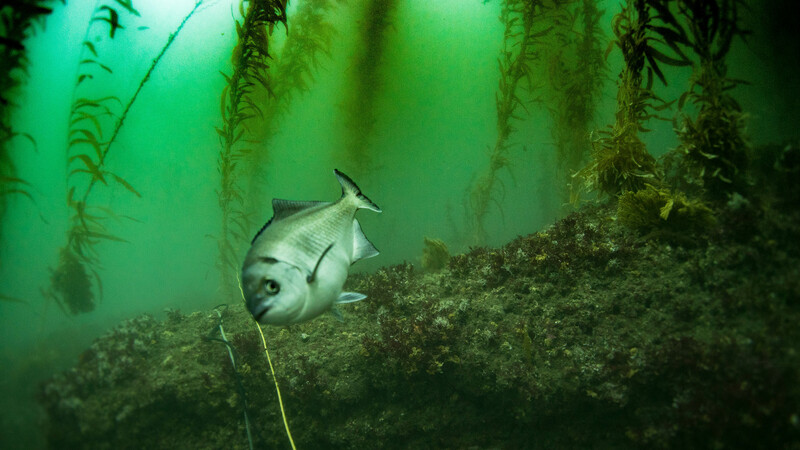 A diver deploying FishOASIS in the kelp forest off La Jolla, CA. 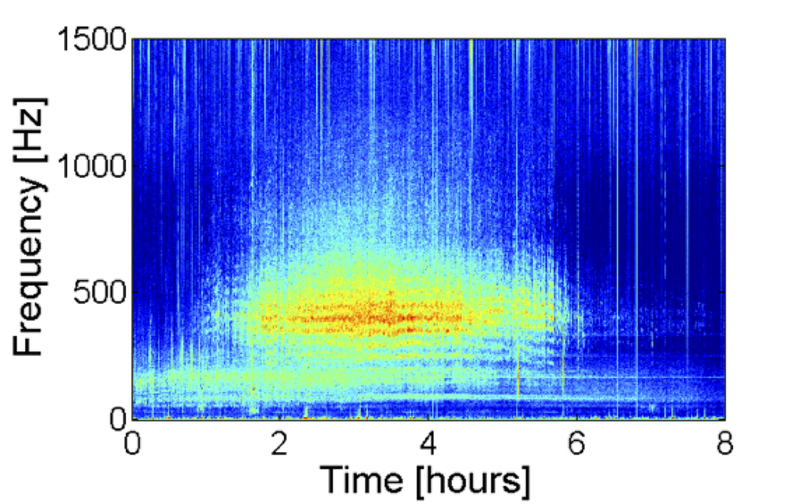 Choruses (i.e., the simultaneous vocalization of animals) are often associated with fish spawning aggregations and, in our work, FishOASIS was successful in recording a low-frequency fish chorus in the kelp forest off La Jolla, CA (Figure 2). Figure 2. Long-term spectral average (LTSA) of low-frequency fish chorus of unknown species on June 8, 2017 at 17:30:00. Color represents spectrum level, with red indicating highest pressure level. The chorus starts half an hour before sunset and lasts about 3-4 hours almost every day from May to September. While individuals within the aggregation are dispersed over a large area (approx. 0.07 km2), the chorus’ spatial extent is fairly fixed over time. Species that could be producing this chorus include kelp bass (Paralabrax clathratus) and halfmoons (Medialuna californiensis) (Figure 3). Figure 3. A halfmoon (Medialuna californiensis) in the kelp forest off La Jolla, CA. FishOASIS has also been used to identify the sounds of barred sand bass (Paralabrax nebulifer), a popular species among recreational fishermen in the Southern California Bight (Figure 4). Figure 4. Barred sand bass (Paralabrax nebulifer) call. This article demonstrates that combining multiple cameras with multi-element passive acoustic arrays is a cost-effective method for monitoring sound-producing fish activities, diversity and biomass. This approach is minimally invasive and offers greater spatial and temporal coverage at significantly lower cost than traditional methods. As such, FishOASIS is a promising tool to collect the information required for the implementation of passive acoustics to monitor MPAs.